Mercy Housing provides housing, programs, and resources to provide its residents with the support they need. If you are with a community agency or service provider (mobile health clinics, kids programming, county or city government agencies, fitness teacher, financial advisor for low-income individuals, etc.) contact us to find out how we can customize a partnership opportunity with your organization. 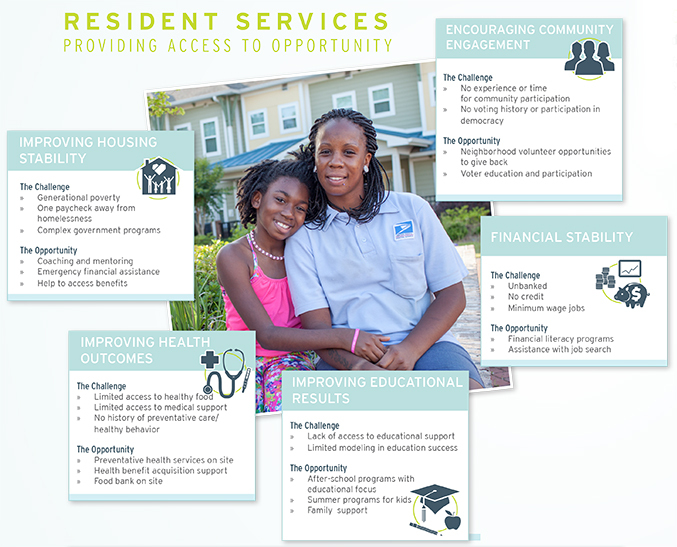 Interested in Partnering with Us to Provide Resident Services? Mercy Housing has a rigorous monitoring and evaluation plan that assesses the impact of our programming. Using a variety of tools such as surveys, resident assessments, as well as community-level data, we use this information and to improve and refine our programs. Today, we have Resident Services at approximately 75 percent of our properties so that all of our residents can benefit from the support and assistance Mercy Housing provides. Our goal is to have them at every Mercy Housing community. Mercy Housing is committed to the use of best practices in Resident Services delivery, program evaluation, and program model development. Best and promising practices based on the strongest available evidence of effectiveness are derived from program evaluation, expert advice, and practical wisdom. The practices in use are reviewed annually to ensure they represent the most efficient approaches available based on the population and setting.